Memories of a Nidan: Elitism by default ? The third time around Goju I noticed that the class had a pronounced lack of young students. The few teenagers or kids I saw were either brought by their mothers as an after school activity, a bonding experience, a disciplinary measure, or were the sons or daughters of practicing karatecas. And even so, these were few and tended to drop out after a few months. So the median age was over 30. Scarcity of new blood is a dangerous thing for a karate school. I saw the Sensei desperately seking his successor among the few young people there, and there were some very good candidates. But, alas, in time, these would also abandon karate for school, marriage or work. Why? A young person now has many alternatives in which to distract him or herself and the attention span is shortened. What there generally was were "old school" karatecas, molded in another time, with other ethical parameters foreign to younger generations. This created a vicious circle, as young people entered an "aging" school and were inevitably turned off by the clear generation gap. Who would want to practice with old fogies. 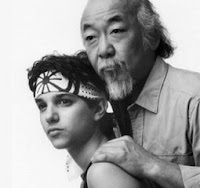 When I began karate, the median age was 21. Thus I was now practicing with people with 10 or more years of some karate experience, but that held jobs, had families and other pressing commitments. The truth of the matter is that the young mostly gravitated to TaeKwondo or martial arts schools that competed in fighting and kata tournaments. Young people did so often drop in but would soon tire of our traditional curriculum and outlook. So what we had was a few seasoned practitioners. But the school was still fashioned with young students in mind, so we were put through the grinder as if we were kids, but we were not. When I took my black belt, all of us were over 40, just one was under twenty.